Poland is becoming a truly vegan-friendly country. Warsaw has been named as one of the booming cities when it comes to vegan and vegan-friendly restaurants, right alongside Los Angeles and Berlin. Consumers are seeing more plant-based products on the market shelves as the biggest retail chains respond proactively to a trend that is growing now, more than ever. The RoślinnieJemy campaign (run by Open Cages, Poland's largest animal rights organisation) has teamed up with the restaurant chain to launch 100% plant-based options in 76 of their locations all over the country. According to the latest research done by Roślinniejemy, 57,8% Poles have declared to reduce their meat consumption in favour of plant-based products. Respectively, research done by Mintel in 2017 states that 10% of Poles between 25-34 identify themselves as a vegan. Veganism has become mainstream thanks to the popularity of bloggers such as Jadłonomia, who now hosts her own tv programme. Major brands and restaurant chains have begun to respond to customer needs immensely and Olimp's move towards a plant-based menu sets the narrative for other chains to follow. Inspired by the Meatless Mondays movement, vegan options will be available at Olimp every Monday. The menu is highly seasonal and was prepared together with RoślinnieJemy specialists. Prior to the campaign launch, RoślinnieJemy hosted a series of plant-based cooking workshops where Olimp’s cooks got to learn about the abundance of vegan options. For most of them, it was their first approach to vegan cooking. Among beetroot burgers and vegan lasagne, cooks loved making aquafaba mayo. 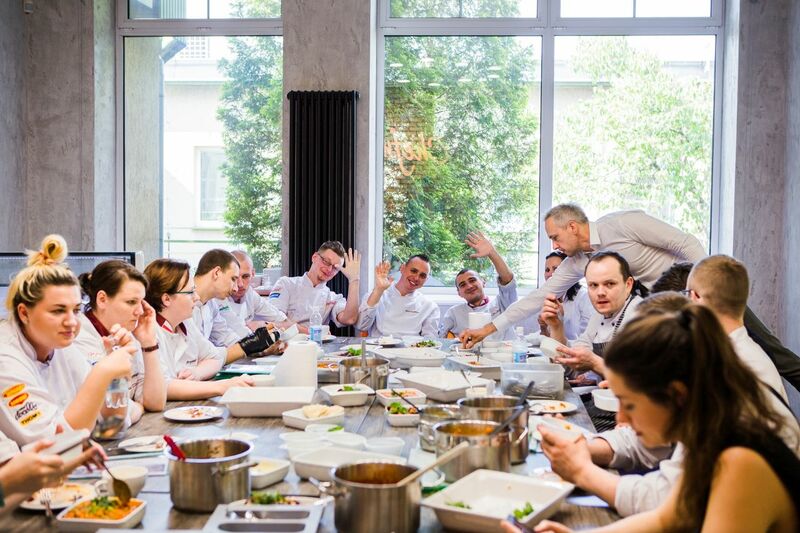 "We’ve decided to launch plant-based options in our menu and join the Meatless Mondays movement as we believe that veganism is not a temporary trend, but a lifestyle choice for many of our customers" - says Piotr Niemiec, the owner of Olimp Restaurant chain "Seeing how engaged our cooks were during the workshops held by RoslinnieJemy makes me sure that it was the right choice to launch more plant-based options" concludes Niemiec. Thanks to Olimp, plant-based options will be now available in most Polish cities, even some that until now have not been very exposed to the rise of plant-based diets. Roślinniejemy is a business & social campaign working both at industry and consumer level. We are serving as experts in plant-based diet and business and amplifying the vegan trend in Poland. Cooperation with major food industry brands, lifestyle and professional media as well as major Polish food influencers is our main focus. Olimp Restaurant chain is a franchise offering a self-service system and selling meals by weight. Olimp is owned by Gastromall Group and now operates with 76 restaurants, which makes it the biggest and the fastest growing self-service restaurant concept in Poland.